Hello Ladies! Does anyone else feel like this weekend flew by? I feel like I blinked and it was Sunday night. Despite how quick it seemed to go by, it was definitely a fun one! 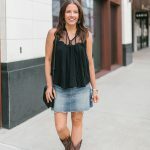 When it comes to spring and summer weekends, this outfit would be perfect! 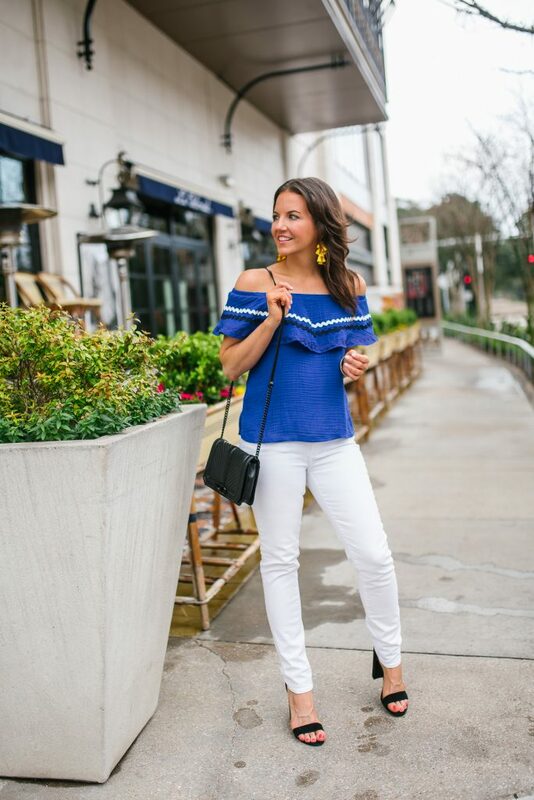 This blue off the shoulder top is so fun and can easily be dressed up or down. I’m planning to pair this top with shorts too this summer. I think the shorter length of the top will pair perfectly with a pair of white or black cotton shorts. 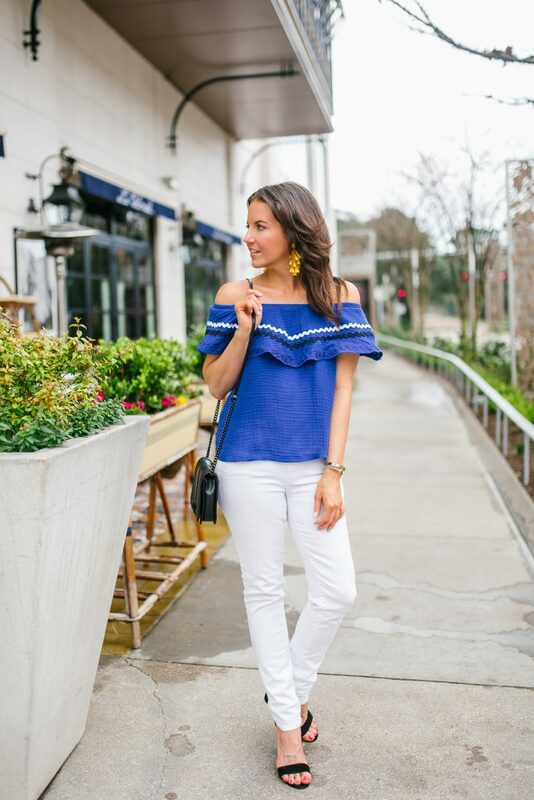 For a spring outfit idea, I decided to pair this top with my white skinny jeans. 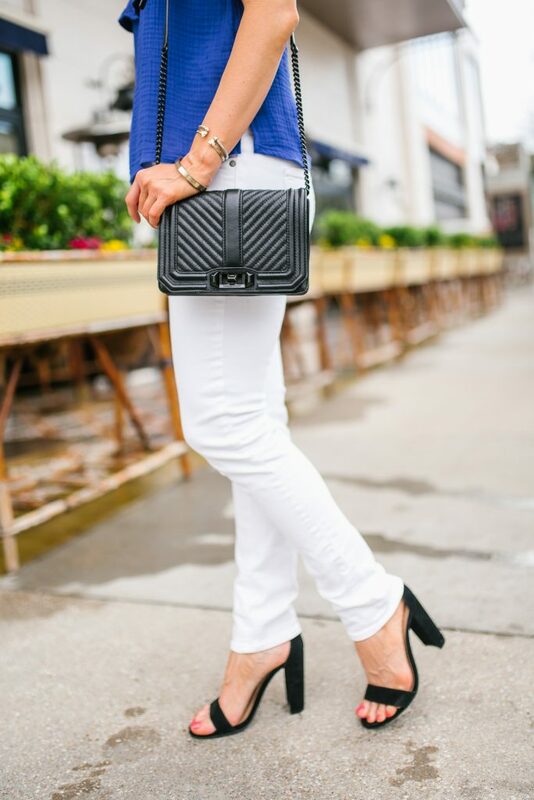 Bright and bold colors really pop when paired with white. 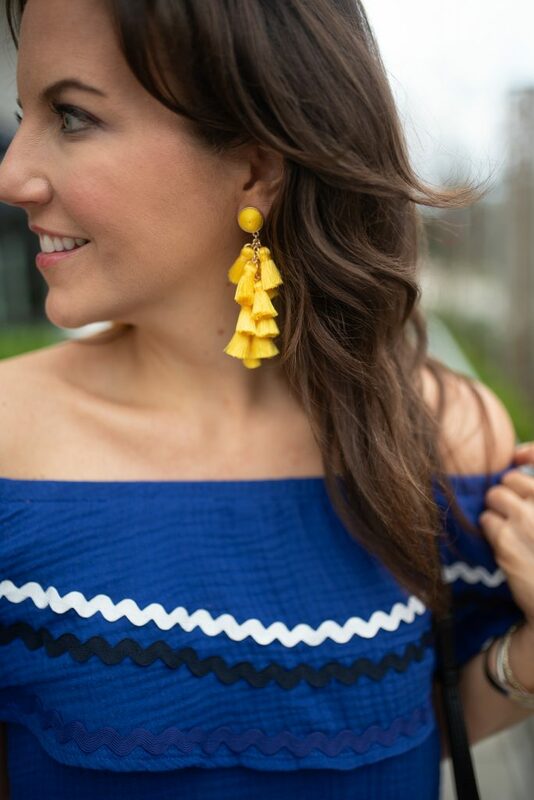 I tossed in a little bit more color with these yellow statement earrings. I think pink would be another good pop of color to pair with this blue top. Alright ya’ll, I hope you have a fabulous week and thanks for stopping by! 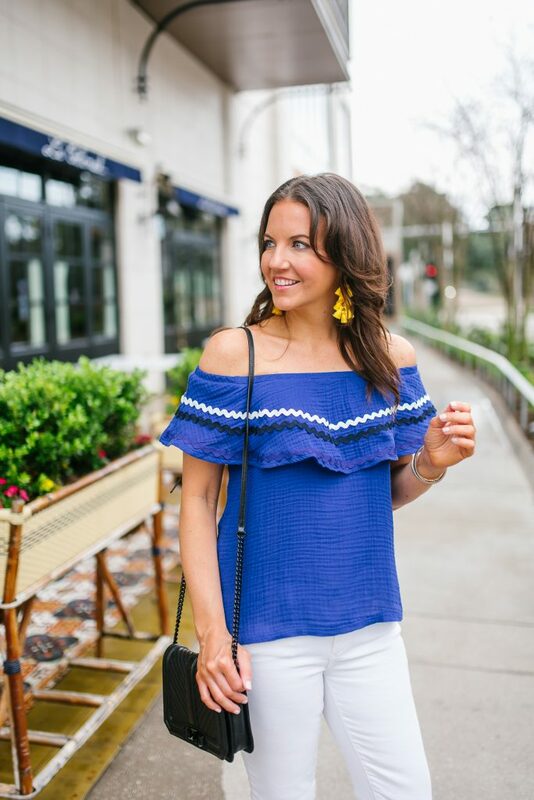 I am obsessed with off shoulders tops! Your top is darling and that shade of blue is so pretty on you! Love the yellow pop from your earrings! 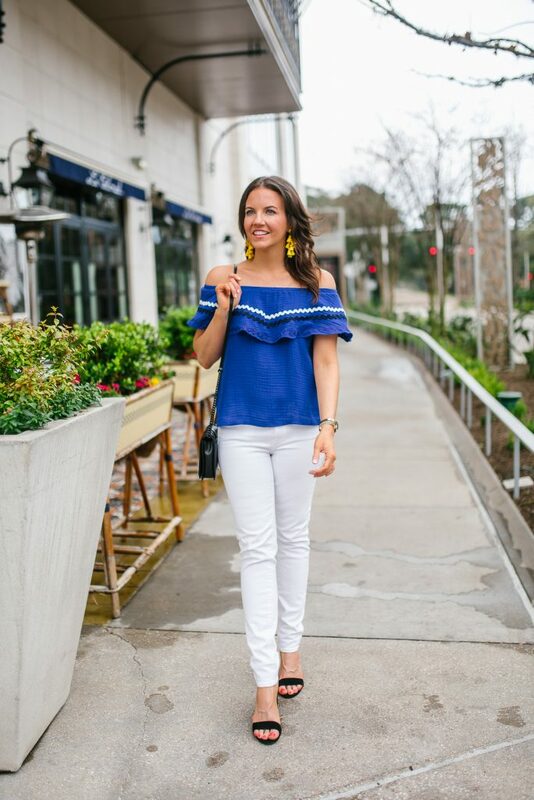 Oh, I love this vibrant blue top!! It looks beautiful with your white denim and pop of yellow. Gorgeous look! Yes I agree that the weekend just flew by! 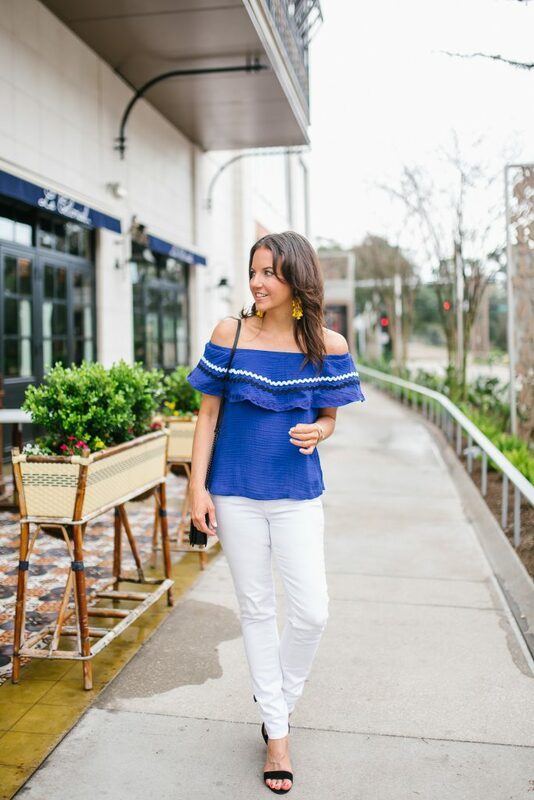 Actually I think this entire year is flying by….I love this blue off the shoulder top. 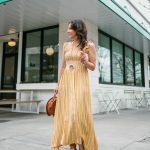 The color is beautiful and totally screams warm weather! I like how you paired with with white denim and yellow earrings. It’s a nice pop of color! I need some yellow earrings! Great pop of color! I actually changed clothes this morning and switched to white jeans! So springy! I love this outfit!